Syd is the woman of my dreams. My immediate favourite track on Stillness In Wonderland is Little Simz's (is that correct grammar? I'm not sure) is 'Shotgun' featuring Syd (Tha Kyd) of The Internet and OFWGKTA fame. Her voice is just an absolute dream. My absolute dream. 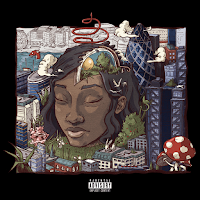 And Little Simz works really well on this mellow The Internet-esque jazz instrumentation. I really don't think that this is a collaboration I ever would have put money on to work, but 'Shotgun' is a really great track. With the 90's like backing vocal "oohh"s too, there are quite a few elements within this song that point to it going down well on radio and with a mass market generally. I think I'd like to hear Little Simz do more pop leaning songs like this because she's pulled it off pretty flawlessly. Also Syd's new solo album is finished. What a time to rejoice.